Intellisphere, L.L.C. 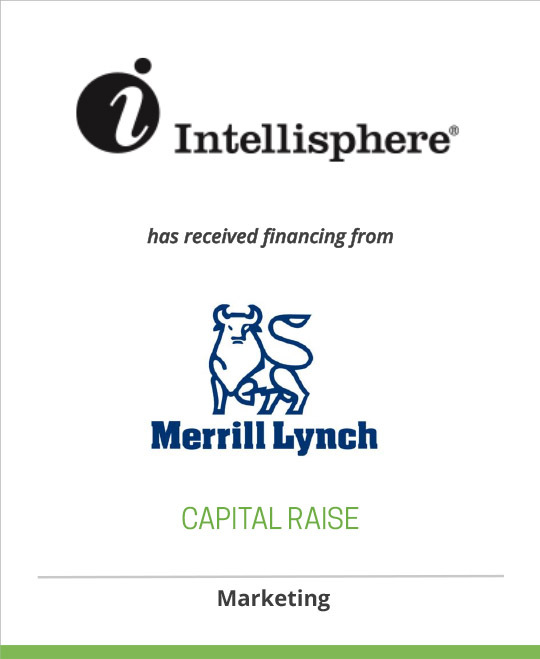 and HRA, LLC, leading healthcare media and market research companies, have arranged a senior credit facility from Merrill Lynch Capital, a division of Merrill Lynch Business Financial Services Inc.
A pioneer in the integration of print and Internet media, Intellisphere, LLC is the publisher of the award-winning series of MDNG journals, custom publications, websites, and e-mail newsletters (eDigests) (www.mdng.com). Published in nine editions with a unique, contemporary voice, style, and look, MDNG explores technology, computers, and the Internet, from the very practical to the most sophisticated, and the impact they have on the professional and personal life of the physician. Connecting more than a quarter of a million physicians and specialists to current and emerging healthcare technology trends, hundreds of online resources, and the latest breakthroughs affecting their medical practice, the MDNG series of publications, sites, and custom products have continually profiled the best online content for physicians, patients, and their caregivers. HRA Research is a leading healthcare market research company that specializes in the pharmaceutical, biotechnology and medical device industries. Our complete portfolio of syndicated products and custom research services provide our clients with actionable intelligence from the hospital and office settings. HRA has established a reputation as a provider of accurate data and intelligent analysis. Our team of talented professionals combines deep domain expertise in healthcare, business, medicine, science, statistics and market research to meet your information needs and deadlines. HRA utilizes both quantitative and qualitative research tactics to gather data on healthcare products at every stage of their lifecycle. Our methodologies, rigorous quantitative analysis and extensive use of primary research ensure unparalleled insight and accuracy. Our approach, combined with our specialized knowledge and years of experience, provides our clients with a deep understanding of markets, issues and trends not available anywhere else. Our deliverables are not only recognized for their reporting rigor but also for the presentation-ready formats in which they are provided to the clients. In short, our deliverables provide both the insight and accuracy required to drive pertinent business decisions, directions and results. Merrill Lynch is one of the world’s leading wealth management, capital markets and advisory companies, with offices in 38 countries and territories and total client assets of almost $2.0 trillion. As an investment bank, it is a leading global trader and underwriter of securities and derivatives across a broad range of asset classes and serves as a strategic advisor to corporations, governments, institutions and individuals worldwide. Merrill Lynch owns approximately half of BlackRock, one of the world’s largest publicly traded investment management companies, with more than $1 trillion in assets under management. For more information on Merrill Lynch, please visit www.ml.com.